ABC magazine recently visited Bundaberg, a large country town in Queensland not far from the coast with a population of about 50,000, to visit local bus company Bundaberg Coaches. It is surprisingly very green and has beautiful tree-lined streets and some great historic buildings. I hadn’t visited Bundaberg for almost 20 years and was looking forward to a test drive in a newly arrived Denning Coach around this picturesque place. Jason Beresford is the owner and director of Bundaberg Coaches. When you speak with him, you assume from his knowledge and the company’s success that he boasts a long career in the bus industry. Yet, asked about his background, he describes his prior history in the air force and in aircraft maintenance, so the purchase of the company was a huge career change and one that the passion for his company shows was a good move. He did admit his father was – and is – a good businessman whom he talks to several times a week, and that he has always accorded him strong guidance in running the business. Beresford credits reliability as a major factor for going with the Denning, along with ease of availability of parts and ongoing support and parts supply. "Predominantly we have always run European vehicles but have had issues – not in getting parts, but sometimes the delays in getting the parts and the additional costs added for them to arrive in the country. "I spoke with lots of other operators running Denning for their opinions and I did some parts replacement comparisons with them and it ended up being a no brainer. "Also, because we do a lot of remote tours, if you are out in central Australia or outback Queensland and you need parts, sometimes it’s not only the availability of the parts [which is an issue] but also getting people with the knowledge to work on and replace the parts. "Cummins and Allison are brands run by many truck and bus companies so it’s easy to find people with a good knowledge of them." The quality of Denning’s build was also an important consideration for Beresford. "Everything is bigger and stronger [in a Denning]. Next year we are doing a tour out to Birdsville with hundreds of kilometers of dirt road. With this coach, I won’t give the trip two thoughts – I have that much confidence in it. "If you ask Denning, we ticked all the boxes on the spec sheet and have ended up with an unbelievably quiet and comfortable coach with excellent resale prospects." On any test drive I like to see how Australian design and manufacturing gets incorporated amongst overseas technology, with Beresford saying "I like to think of it as Australian over American". "The engine and transmission, the running gear, the brakes and axle are American, but the whole chassis is 100 per cent built by Denning in Brisbane, and that was a major factor in our decision to purchase this coach. "We do like to support the local economy as much as we can. The Styleride seats are also made in Brisbane." On the topic of the Denning chassis, stability is a major benefit as the air bags are mounted really wide and the roll is greatly reduced. It handles a lot firmer than a many other coaches, but the full benefits of the extra stability come in when it’s fully loaded, with Beresford saying it corners beautifully because of it. Also equipped is a 1000-litre fuel tank and a larger AdBlue tank than normal. Because it’s relatively new it’s still running in, Beresford claims, but so far the fuel consumption has been "very good". Driver comfort also played a big part in the purchase. "This can be seen in the layout of the dash," Beresford says. "We moved buttons to what we felt were more appropriate places for ease of use, we moved the retarder stalk onto the steering column, but I guess for drivers the major drawcard – which we will do in all our new vehicles – is the bunk that really is more of a driver’s cabin." The cab contains its own independent power supply, air-conditioning, TV and DVD player, charging ports, storage areas and a large king single bed, which is perfect for when a driver is waiting at extended stops. "If a driver takes a group of kids to Movie World, they may have a six-hour break during which they can jump into the cabin and have a sleep or watch a movie, all in air-conditioned comfort," Beresford says. "The driver is then refreshed ready for the drive home. We look at this as real fatigue management for our drivers. "We have this feature in two coaches already and will have it in all future coaches we purchase." This was actually my very first time driving a Denning, so I had no pre-conceived ideas about what to expect or any comparisons to what I've experienced. It’s always interesting to hear the logic behind a company’s choice as to why it chose a particular new addition to their fleet. Beresford has only been in the bus industry for six years, so obviously with no long history of driving different vehicles it’s clear he has done his homework and feels very confident with his choice. Being a high-deck, the front externally has a huge expanse of glass. 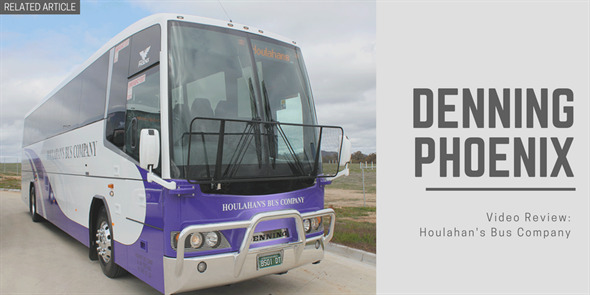 There are 52 reclining seats and smart Bundaberg Coaches branding – you can’t miss it. Effective branding is always a positive for smaller companies. When you see a good-looking coach on the road it’s good to see who it belongs to, especially when it’s close to home and you might remember it better for future reference. The LED daytime running lights look great, though my only criticism is the driving spotlights cover the Denning branding, which is not the best for company advertising. Underneath is a slide-out fridge and hot water urn. A cold bottle of water was really appreciated as Bundaberg is a very warm place to visit. Off to a great start, remote keyless entry to open the coach means no need to carry heavy keys around. Internally, the driver’s area is set out great for touring. There is a lot on the dash but it’s all colour-coded and easy to navigate. The mirror controls directly beside the driver’s armrest are easy to use. Cruise control is also mounted here, which isn’t the standard place as it’s usually on the dashboard. We didn’t have the opportunity to use it and see how it feels, however. Driver visibility is great with all the glass. Music playlists are easy to select, and a bonus for the driver is a reversing camera with sensors, which is easy to get used to. One feature that stands out is the bunk – no more dropping off passengers and spending uncomfortable hours waiting. The driver can climb into their own air-conditioned cabin, have a sleep and recharge or watch a movie; all without leaving the bus. Bundaberg Coaches drivers must really appreciate it. When you start the Denning, you are impressed by what you don’t hear. Beresford says it ticked all the boxes for soundproofing and it shows. He guided us out to some scenic country roads and over a river crossing on the Burnett River, where we got to spend a fair bit of time driving and reversing until we got the video perfect. I got to use the camera, which was very helpful, but years of using my mirrors meant I kept reverting to doing things manually. Beresford mentioned the stability was a major positive for him and the coach felt great around corners. The air bags are wide-set and this obviously keeps things super stable, eliminating the rolling feeling you sometimes get with taller coaches. The trusty Cummins ISM 11-litre with 440hp was what you’d expect when matched to the 6-speed Allison transmission with six-stage retarder – a great and dependable combo. It has dual-circuit EBS (includes ABS) service brakes but they didn’t get much of a workout as the retarder does the heavy lifting in the braking department for you. Driving back to Brisbane in a hire car, we would have enjoyed the trip way more behind the wheel of Beresford’s Denning. The Burgess family initially established Bundaberg Coaches in 1972 before it was purchased by Mick and Carol Foley about a decade later. They owned the business until Beresford purchased it in 2011. "When I purchased the business, the Foleys had scaled it back from several to two vehicles to make it more manageable to sell," Beresford says. "We currently have six vehicles in total – four coaches and two smaller vehicles. We have two Mercedes coaches, the MAN, and the new Denning." The company employs up to 10 drivers and four office staff, including a tour hostess. It now does a lot of school charter work but focuses on the long-distance charter because its coaches are tour-spec vehicles which better suits that line of work. "With the distance between Bundaberg and Brisbane, we do a lot of work covering this route," Beresford says. "Return day trips are very popular with schools visiting the capital to go to Southbank, the Lyric Theatre and the museums. For end-of-year school camps we take groups away for several days, concert tours and, of course, visits to Movie World and Dream World are always popular. "Being four and a half hours from Brisbane is the ideal distance to do a round trip in a day. Each vehicle would probably average 80,000 kilometres per year." Bundaberg Coaches predominantly does coach touring but also got into the charter market because the coaches would be sitting idle between tours. "I thought they could be better utilised so that’s how we broke into the charter market," Beresford says. "When I took over the company the previous owners had concentrated solely on touring, but I saw this as a smart direction for the company." Bundaberg Coaches is the only coach tour company in Bundaberg and subsequently offers a product that suits the needs of its local community. "We have a high retirement population, including the Bargara area, and built the business to have repeat customers that have become almost like family to us. We love that we have lots of familiar faces. "It would have been a loss for the community if we didn’t take over and grow the company. We give these people the ability to travel, it’s very important. "There are large retirement villages in the area and many of the retirees don’t have their own transport. When they settle here, the villages have their own bus services to take them to and from town, so they no longer need to own a car. We offer them the chance to travel and escape and see the countryside. "With the charter side of our business we offer a quality service with a premium fleet. "There are other companies which provide charters but with more generic vehicles so that is Bundaberg Coaches’ point of difference." The company’s website says it is committed to quality and customer focus and has won awards for its service. "It all comes back to customer service and how you deal with your customers. In particular with charter, we try to be proactive. "For example, if we have a roadside issue or problem, our priority is always to take care of our passengers and make sure they are happy and catered for – cost doesn’t come into it." On the touring side, Beresford says there’s lots of emphasis and investment into the training of drivers to ensure they’re of a high standard. Familiarisation requirements exist with each coach before a driver is allowed to operate. They have to go out on trips with other drivers and tour leaders before being allowed to tour, to understand the criteria demanded of them. In any downtime, drivers also clean and polish coach parts. "Presentation is very important, we always ensure the coach is ready for passengers to board again; our attention to detail is really noticed by our passengers," Beresford says. "The minute you rest on your laurels you go backwards. We try to be innovative in all that we do. "Twelve months ago we introduced a loyalty program to reward our regular customers with a points system redeemable on trips. There are no restrictions on it to keep it simple." Bundaberg Coaches has a system in place where it courtesy calls passengers prior to their journey, ensuring they are aware of the itinerary, and provides any details when required – along with extra customer service if called upon. "We like to be open and communicate with our passengers so they are confident and know everything that is going to be well prepared for their trip," Beresford says. "We take our duty of care very seriously. "Recently on a trip to Canberra for the Floriade, a lady had a fall and was unable to continue the journey. She required hospitalisation and couldn’t continue but we did everything to get her home safely. "Our staff were in contact with the hospital, we organised her transport from the hospital to the airport, we liaised with Qantas to make sure she had someone with her at all times and we had a driver waiting at the airport to take her home." Looking to the future, Beresford says he’s focused on long-distance tour work along with tour packages for the school market. "Last time Pink was here we did three sold-out trips to see her, and Mamma Mia is expected to be another big success next year. "I do really enjoy the driving, but it takes me away from moving things forward here. I intend on continuing to grow and develop our business." For someone relatively new to the industry, and with his positive attitude to keeping his customers happy, it’s easy to see why Jason Beresford and Bundaberg Coaches are a success in their region.